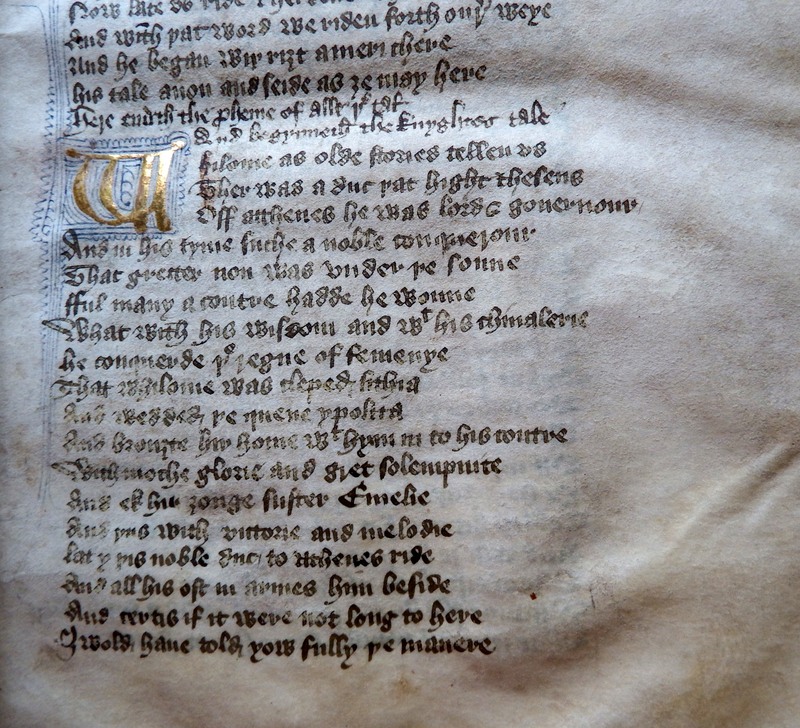 Geoffrey Chaucer wrote the Canterbury Tales between 1387 and 1400. It is the story of a group of thirty people who travel as pilgrims to Canterbury. The pilgrims, who come from all levels of society, tell stories to each other to pass the time on their journey. These stories make up the Canterbury Tales. 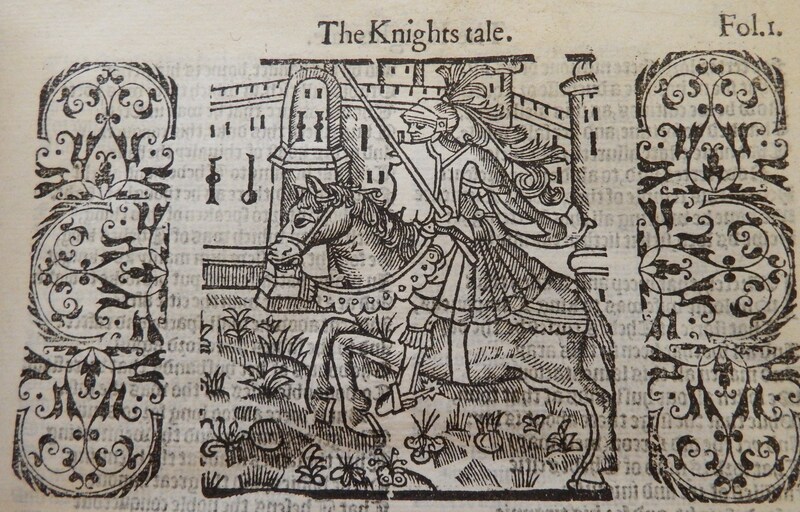 This printed volume is also open at the start of the Knight’s Tale. 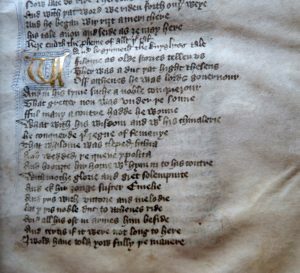 Both copies were owned by Dean Michael Honywood, whose hand written list of contents is also on display. 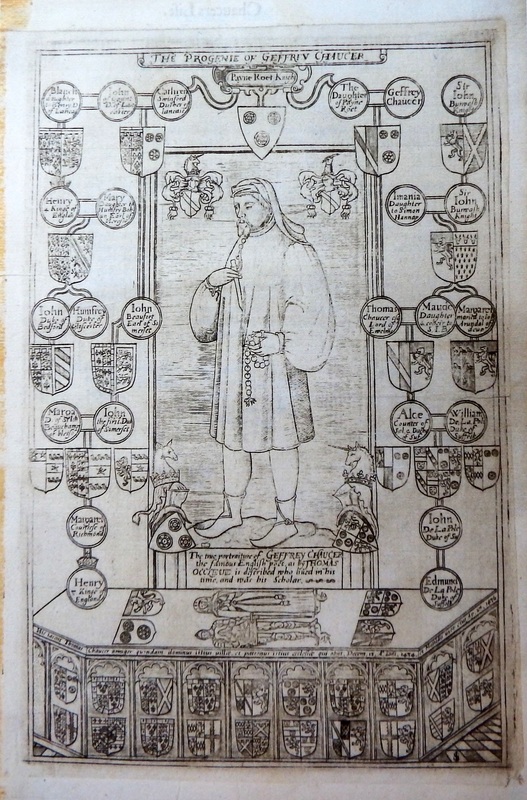 The printed edition is dedicated to Sir Robert Cecil, 1st Earl of Salisbury and Secretary of State to Queen Elizabeth I. 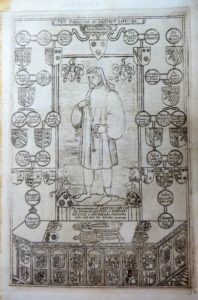 As well as the Canterbury Tales it includes among other things Chaucer’s translation of the Roman de la Rose; his Testament of Love; his Treatise on the Astrolabe; a selection of ballads; definitions of some of the old and obscure words used in his works and a brief biography including a family tree. 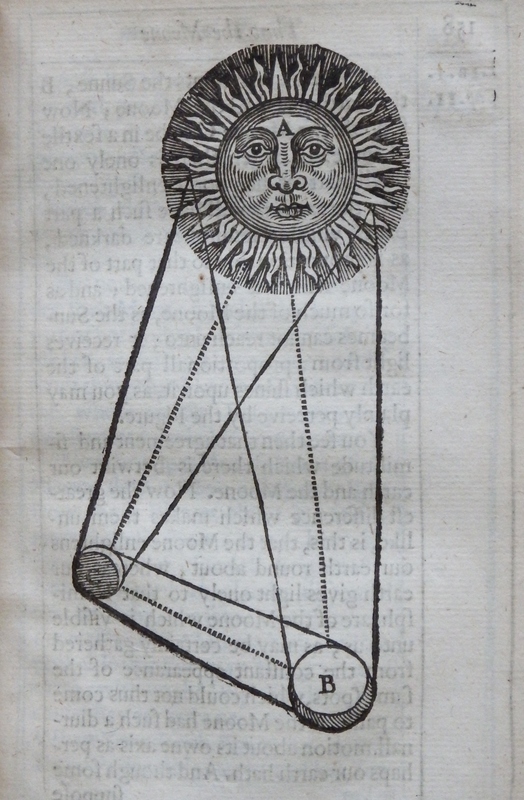 This book is one of the library’s many science books and was written by John Wilkins, Bishop of Chester from 1668 until his death in 1672. It is his attempt to describe the moon: its physical appearance, whether there might be life there and whether, in the future, Man might be able to travel there. 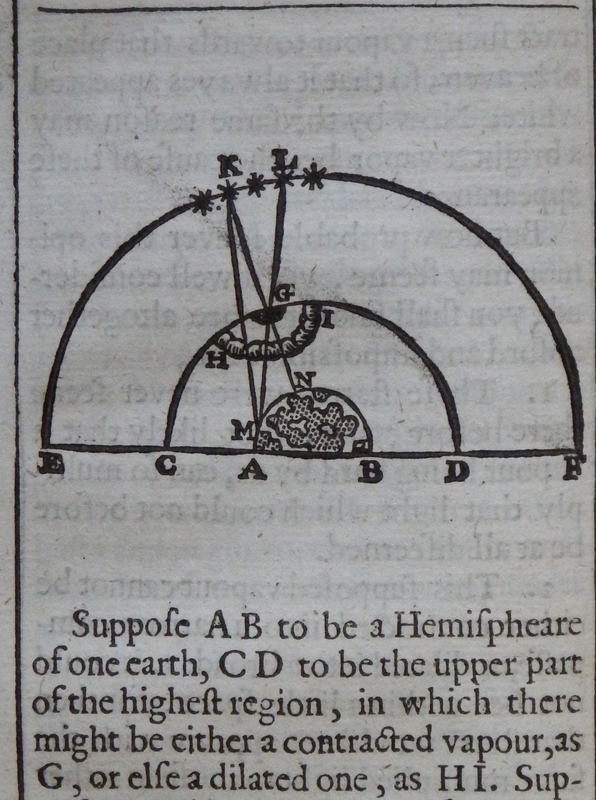 Wilkins was one of the founding members of the Royal Society, set up in 1660 to promote science. It is one of the oldest such societies still in existence. Over the centuries, famous members have included Sir Isaac Newton, Alan Turing, Stephen Hawking and Sir Christopher Wren who designed the Cathedral’s Wren Library. Wilkins stresses that the ideas that he puts forward are merely his opinions, and he is hopeful that future generations, with their greater skill and knowledge, will build on the knowledge of his time, in order to explore the moon further. Wilkins concludes that in order to convey his “chariot” to the moon, Man could harness the power of wild swans from the East Indies which he believes are migrating to the moon. 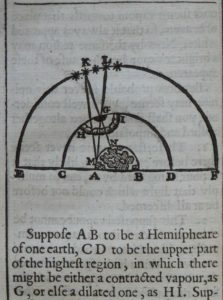 “so that notwithstanding all these seeming impossibilities, tis likely enough that there may be a meanes invented of journeying to the Moone; And how happy shall they be, that are first successful in this attempt”!! 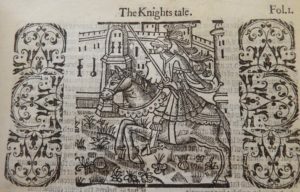 This fascinating little book will be on display in the library until the end of October 2018 as part of our “Old Favourites” exhibition. The Cosmographia Universalis by Sebastian Münster (1488–1552) originally printed in 1544, is the earliest German-language description of the world. Many different editions were printed including the Cathedral’s copy which was written in Latin after Munster’s death. 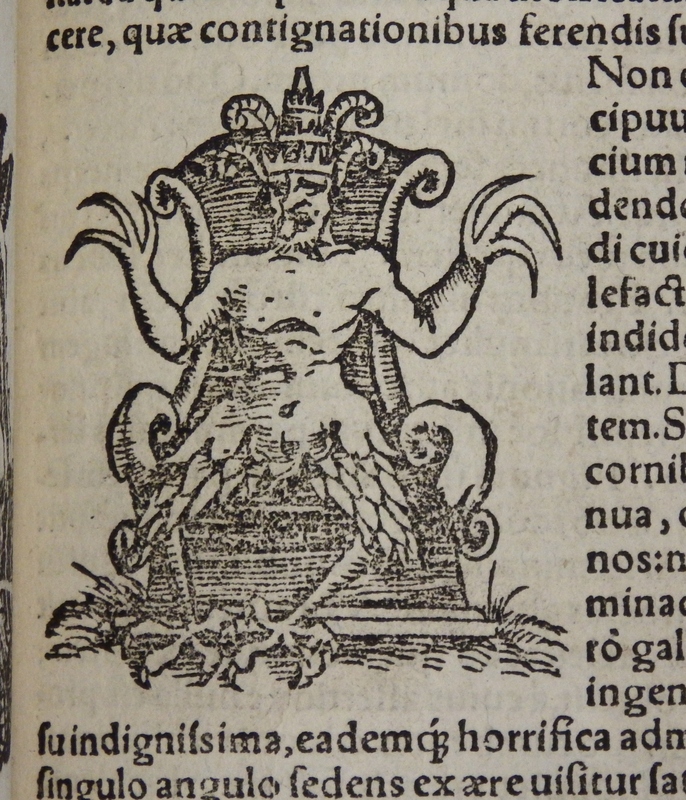 It forms part of our current “Here be Monsters” Exhibition in the Wren and Medieval Libraries. 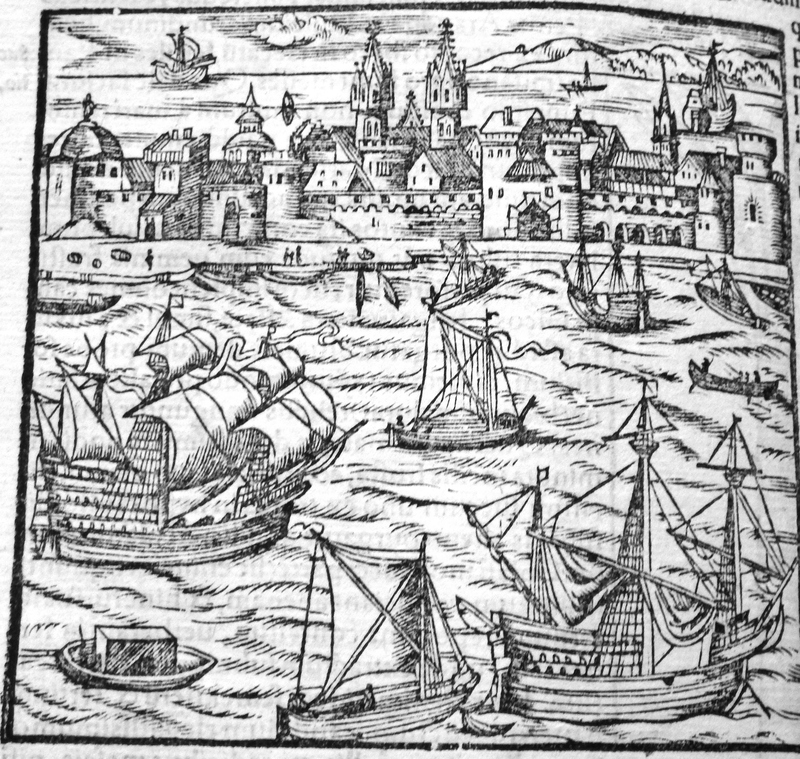 The continued success of this book was partly due to its numerous woodcut illustrations, introducing the reader to new lands; describing the unusual plants and animals found there; showing town plans and illustrating the everyday lives of the inhabitants of places that most people never even knew existed. 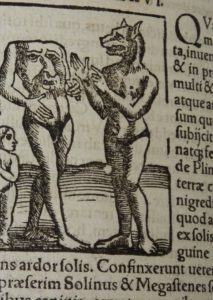 Despite being written in Latin, the illustrations vividly bring this world to life. 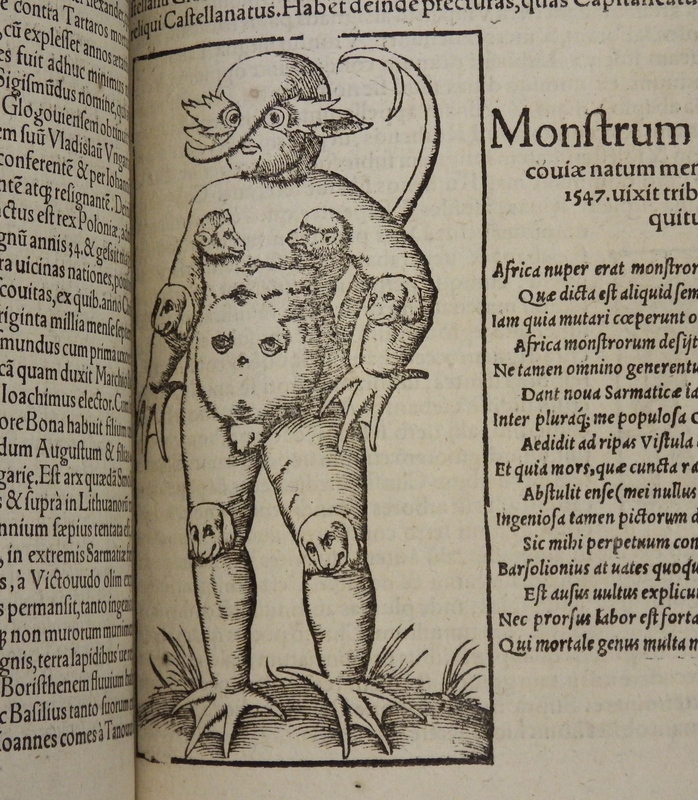 It also contains several illustrations of strange and monstrous “beings”. 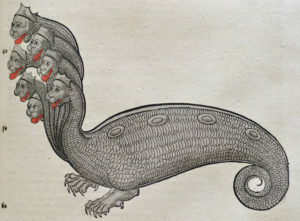 Medieval artists rejoiced in bringing these grotesque, fanciful creatures to life. They were thought to live in remote places at the edge of the world. Below you can see a “blemmyae”, a headless man with his face in the middle of his chest; a cyclops, with one eye; and a “sciopod” or “monopod” with one giant foot under which it would supposedly shelter during hot weather. 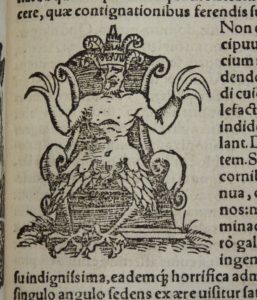 The “Monster of Cracow”, a baby born with barking dog’s heads instead of elbows and knees is also described and depicted in this book. 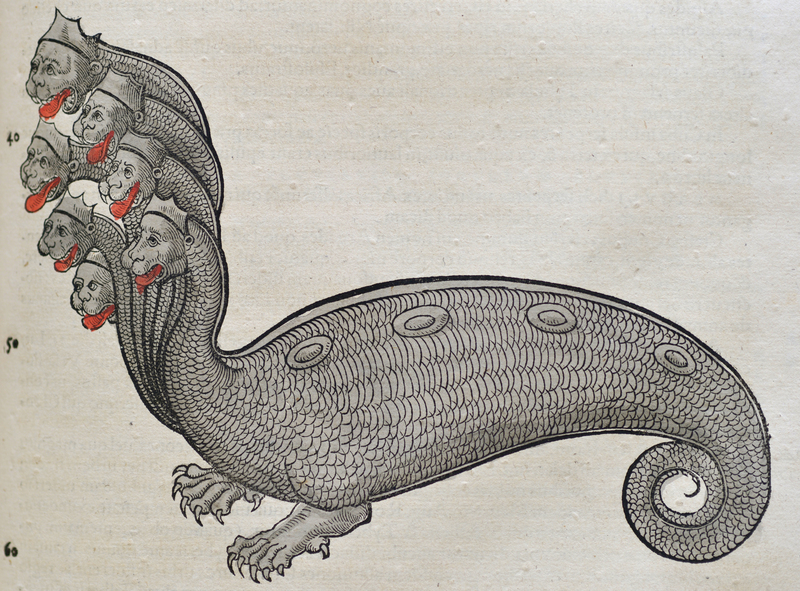 Our “Monster” exhibition is continuing through to September 1st 2018 and you will be able to see these and many other medieval monsters in the books and manuscripts on display. 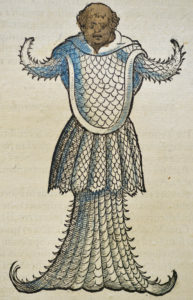 Conrad Gesner “Historiae animalium” printed in Zurich in 1558 by Christoph Froschauer. 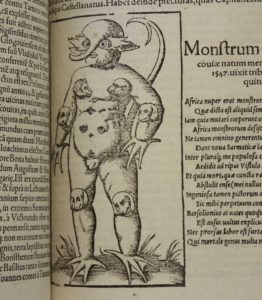 Our summer exhibition of manuscripts and rare early printed books is entitled “Here be Monsters”, giving visitors a chance to see some of the strange creatures that existed in the imaginations of Medieval artists. 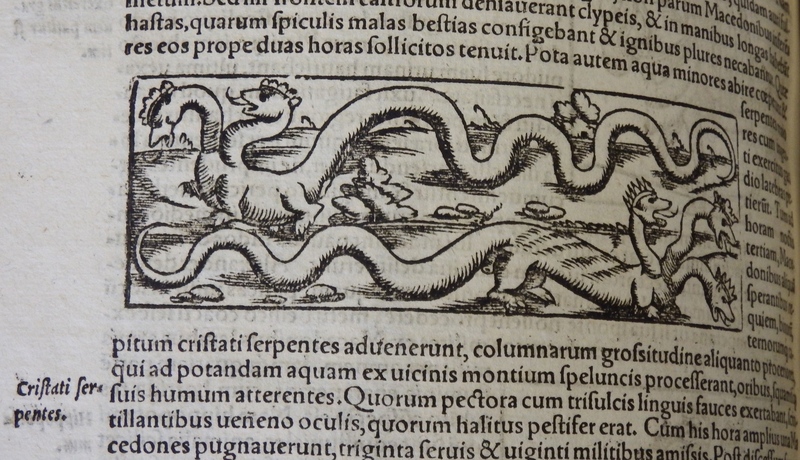 One of the books featured is Conrad Gesner’s “Historiae animalium” printed in Zurich in 1558 by Christoph Froschauer. 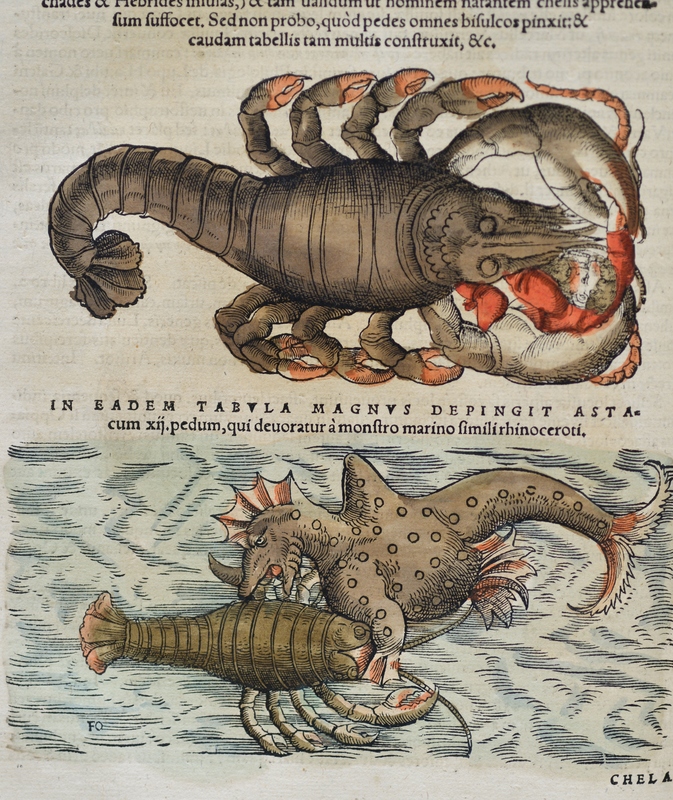 This is believed to be the earliest modern zoological work of its type. 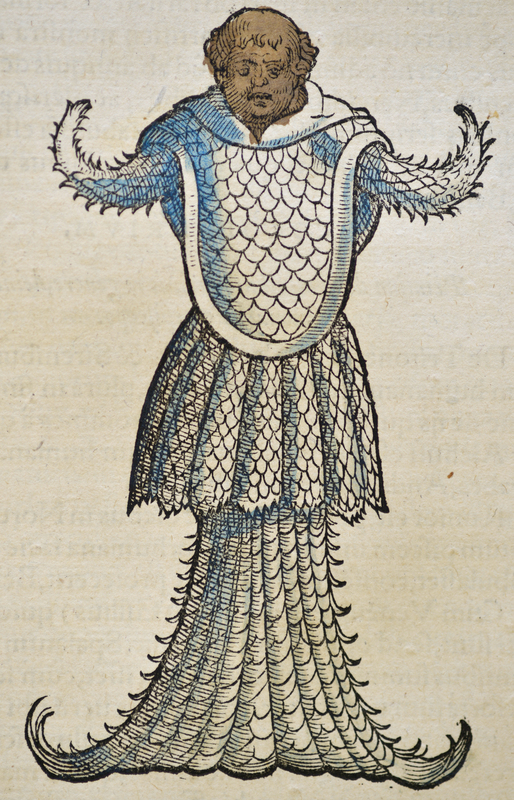 The library has three volumes, one on quadrupeds, one on birds and this one on sea creatures. The books are decorated throughout with fine hand coloured woodcuts. 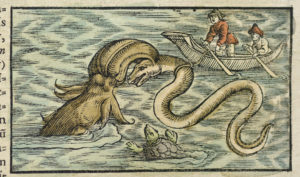 Although the work was intended to be factual, many mythical and fictional creatures are also described with information from pre-existing sources such as the Old Testament, Aristotle and medieval bestiaries. 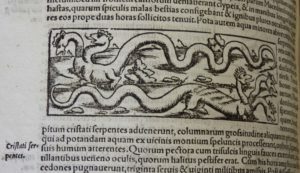 Written in Latin, the book describes in great detail the life cycles, eating habits and behaviour of the different creatures. 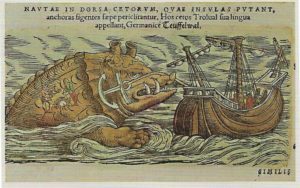 It is currently open at the description of the whale which in medieval times was feared due to stories of whales terrorising ships and swallowing them whole. 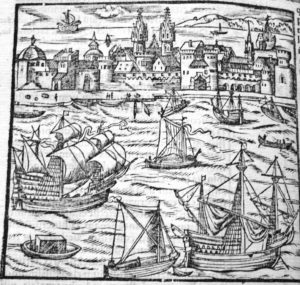 One of the illustrations even shows two sailors who have mistaken a whale for an island and have lit a camp fire on it. 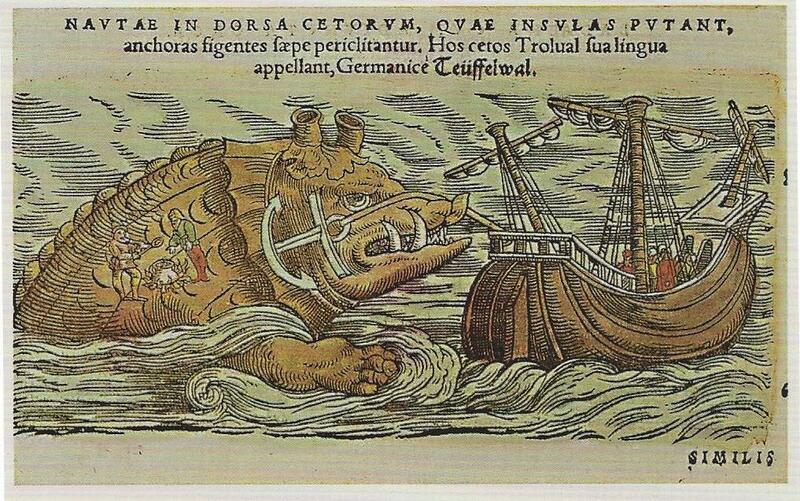 Centuries ago the sea was regarded as a dangerous and unknown place full of all kinds of monsters. Medieval maps show them roaming the seas and unknown areas of the world were simply described with the words “Here be monsters”. Even today the deepest oceans conceal many secrets from us and we have a lot to learn about the creatures that live there. 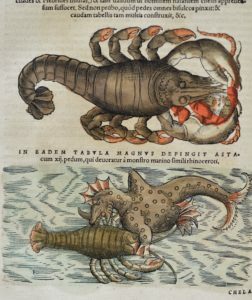 If some of these creatures actually existed, it would certainly make you think twice before going for a swim in the sea!